Valentine’s Day is a great time to show the ones you love just how much they mean . While we spoil our loved ones with flowers, balloons, conversation hearts & of course, chocolate, our pups also want in on the action. Americans consume 2.8 billion pounds of chocolate each year. During Valentine’s Day alone, the US consumes almost 58 million pounds of chocolate. This poses a threat to anyone who owns a dog. Dogs are easily tempted to want & love what you have, without knowing the danger of why they want, what they want. Dogs & chocolate don’t mix. Chocolate is toxic to dogs and depending on the type and amount of chocolate consumed and the weight of your dog, it could cause a serious medical emergency. Chocolate contains caffeine and a toxic chemical called, theobromine. Humans can easily digest theobromine, but it takes much more time for a dog to process the component. So much more time, that it builds up toxic levels in your pooch. Different chocolate types have different theobromine levels. Cocoa, cooking chocolate and dark chocolate contain the highest levels, while milk chocolate and white chocolate have the lowest. If you think your dog has eaten chocolate, call your veterinarian 1st. Try to induce vomiting. Many dogs will naturally eat grass when they’ve eaten something that doesn’t agree with their stomachs. Keep your canine friends healthy. Keep chocolates & other candies out of the reach of your sweet, innocent puppy paws. Everyone will be happy & healthier in the end. 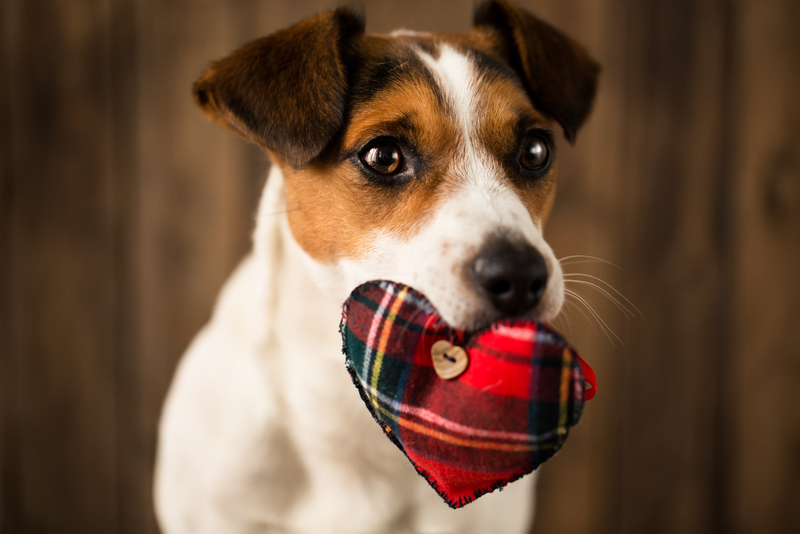 Enjoy Valentine’s Day without having to worry about your canine companions desire to indulge.